Part One: An upgraded truck, a new drone, and a great adventure! Every summer I spend my five-day vacation camping and exploring Nevada, the Mojave Desert, and parts of eastern California. 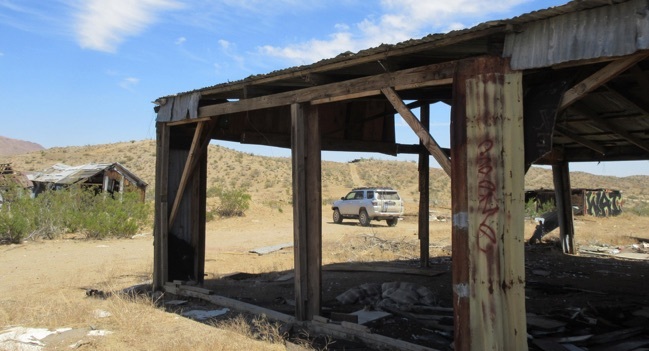 I explore old ghost towns, mines, mining camps and anything else of interest, while enjoying the beautiful scenery and wide open spaces. 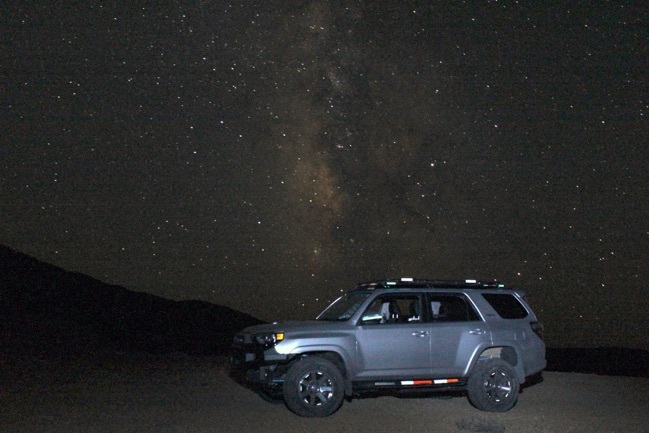 Last year was the first trip with Megaweapon, my 2016 Toyota 4Runner. 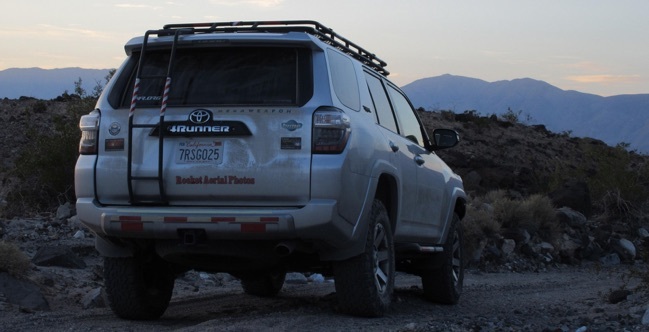 This year Megaweapon has several upgrades, including new skid plates, bumper, and a lift. I saw some interesting places for the first time, and revisited some old favorites. I saw dilapidated ruins, and a well-maintained miner’s cabin. I visited abandoned mines and mills, and the Nevada Northern Railroad Museum. I saw scenic wonders such as Rainbow Hills, Sawtooth Ridge, Fish Lake Valley, and the lithium works in Clayton Valley. Above: Loaded up and ready to go. For the first time in many years, I did not bring any rocketry stuff. Now that I have the drone, I’ve basically given up rocket aerial photography. That gave me plenty of room to haul more camera gear, plus the drone, with some room to spare. 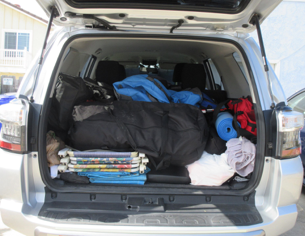 Then there’s the basic camp gear -- sleeping bag, pad, chairs, tarps, tent (just in case), clothes, etc. Plus tools and extra gas. On the rear seats I had two ice chests full of food and drinks; a box of miscellaneous supplies, camel pack and belt bag. 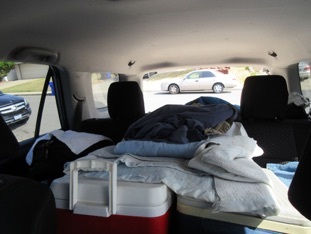 Extra sodas and non-refrigerated foods were stored on the floor between front and back seats. Front passenger seat held my camera bags. 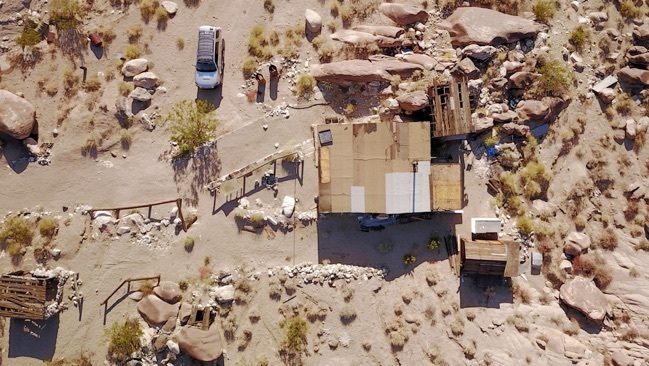 My first stop was a sprawling mining camp just southwest of Red Mountain, CA. I couldn’t find an official name for this area, and it’s at the end of Osdick Road, so I’m calling it the Osdick Road Mines. There are several cabins and small homes here, plus numerous mining structures and some open shafts. Sadly, vandals have heavily damaged the buildings and defaced them with graffiti. My next stop was a real treat. 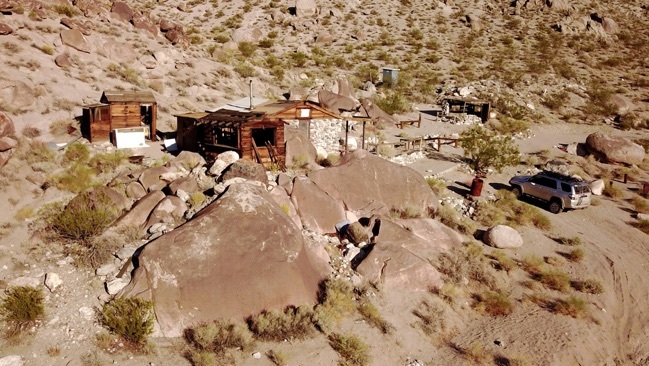 Osborne Camp, also known as Osborne Cabin, is a small, former mining camp tucked away in the upper reaches of a canyon near Panamint Valley. The trail to the cabin is a bit challenging, as it was extensively washed out and difficult to trace. The main structure at the camp is a stone cabin, which has been refurbished by volunteers under the “Adopt A Cabin” program. The cabin has a nice covered porch. Inside there is a wood-burning stove, table and chairs, and other amenities. A small wooden addition holds two rather cramped beds. There is a smaller, wood cabin behind the main cabin. This one is missing most of the roof, and is uninhabitable. There is also a wooden shed, and the remains of a much smaller stone cabin. Nearby is a decent outhouse of fairly modern construction. The camp was associated with a mine somewhere higher in the hills, but I didn’t get that far on this trip. Click here to see video of Osborne Camp, CA. The sun was already setting when I left Osborne Camp, and it was getting dark by the time I reached the highway in Panamint Valley. I drove on into the night, eventually entering Nevada. I set up camp at a place I call Rainbow Hills. While I was there, I shot this photo of the Milky Way. 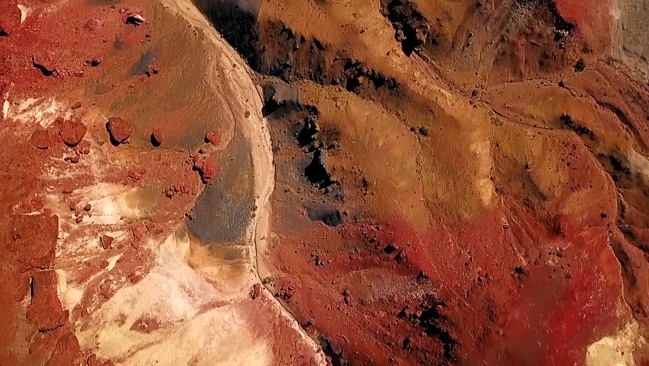 Ancient volcanic activity created this region of vibrant colors north of Fish Lake Valley. It was the perfect place to get some fantastic aerial video with my Mavic Pro drone. 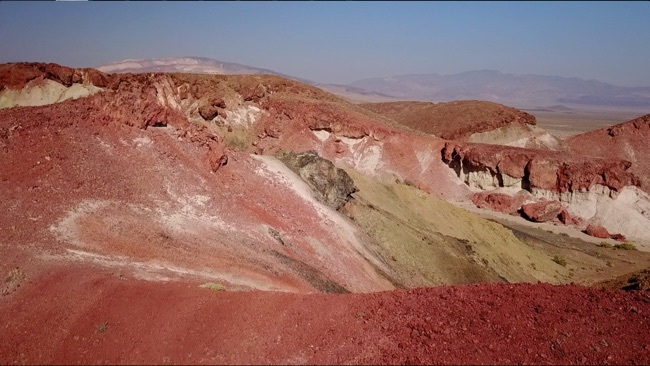 Click here to see video of Rainbow Hills, NV. Above: The farming community of Dyer, NV is located in Fish Lake Valley. This little market is the only place to refuel in the entire region. After leaving the Rainbow Hills, I drove south to Dyer to refuel, then turned north again to the hot springs and dry lake. The dry lake is at the lowest part of the valley and is partially covered with a crust of salt. There are a few green, marshy areas along the perimeter. On the western shore I found the remains of stone buildings, apparently from an early salt works. 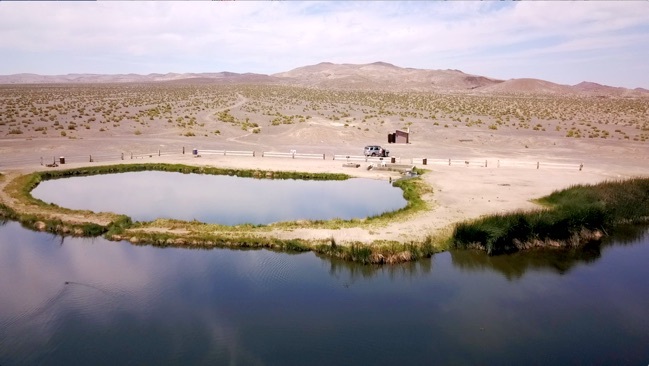 The hot spring is located about three miles from the salt flats. The spring was created accidentally when prospectors drilling for oil or gas struck hot water instead. There are two man-made ponds at the spring, and a “hot tub”. 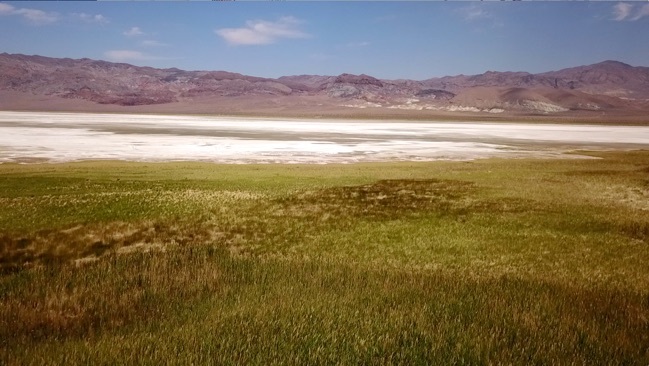 Click here to see video of the salt flats and hot spring at Fish Lake Valley, NV. Coming up: The scenic Sawtooth Ridge, a pioneer ranch, Ruby Hill ghost town, and more as the adventure continues!